Base Price shown is for outdoor unit only. You can choose up to 3 indoor units below with a total connected capacity of 39,000 BTUs. The price displayed will update based on your selections. If you need help configuring a system, please contact us. The Daikin Aurora Series is a perfect multi-zone mini split system for cold weather climates. It features a heating operating range of -13°F up to 60°F and cooling range from 14°F to 114.8°F (with optional drain pan heater). These expanded temperature ranges help to make this tri-zone system a great solution as a primary heating and cooling source almost anywhere in the USA. A mini split system is an excellent way to add air conditioning to separate areas of your home or office. Whether you have just added an additional room or don't have central air, with the 3MXL24RMVJU Aurora Series with Enhanced Capacity Mini Split System you can heat and cool up to three separate areas of your home or light commercial space at one time. Simply choose two or three indoor units based on your individual needs and before you know it, you will have cooling and heating in your space when and where you want it. The MXL Aurora Series system, with inverter technology, works with CTXS and FTXS Standard Wall units, the Emura Series Wall units CTXG, the Vista Series FFQ Ceiling Cassette units, FDXS Concealed Duct units, and FVXS Floor units. Depending on the indoor units you choose, with the 3MXL24RMVJU outdoor unit you will be able to achieve energy efficiency levels of up to 18.0 SEER, 12.7 EER, and 12.5 HSPF. Comfort control with added savings! When connected to all non-ducted units, the Aurora MXL Series is also Energy Star Rated. With Daikin's new enhanced capacity Tri-Zone solution, any three rooms can be controlled individually. It also offers up to 100% Heating Capacity with temperatures as low as 5°F and 100% Cooling Capacity when it is as hot as 104°F. The 3MXL24RMVJU Tri-Zone is rated for 24,000 BTU Cooling Capacity and must be connected to a minimum of two and a maximum of three indoor units. The combined BTU ratings of the units chosen can total up to a maximum connected BTU rating of 39,000 BTUs. The Daikin 3MXL24RMVJU incorporates technology which allows you to connect higher BTU indoor units than its 24,000 BTU capacity. This will allow you to address higher load needs that are used at different times such as living spaces and sleeping spaces. Based on the square footage of the rooms you are conditioning, you may need a 15,000 BTU unit for your living room, a 9,000 BTU unit for your bedroom and a 15,000 BTU unit for the rec room in the basement. With the Aurora Series, you can connect all of these to the 24,000 BTU 3MXL24RMVJU outdoor unit. The system will allocate the required BTUs needed in each area up to the total of 24,000 BTUs. Let's say you need to condition the rec room during the day. No one will be in the living room or the bedroom at this time so you have these zones shut off. When you turn on the system in the living room, the Daikin technology will supply the required BTUs to the living space up to the maximum output of the 15,000 BTU indoor living room unit. A short while later you decide to get the bedroom ready so you turn on the bedroom zone. The system will distribute power to the zones as needed. If all three zones need full power, then each zone will split the 24,000 BTU respectively, based on each unit's own capacity. For example, the 9,000 BTU unit will use approximately 6,000 BTUs while each of the 15,000 BTU units will use approximately 9,000 BTUs per zone. If one zone needs more or is shut off, the system will adjust accordingly. The 3MXL24RMVJU Aurora Series outdoor inverter "variable speed" compressor features a space-saving design and quiet operation. With Reactive Temperature Monitoring, once you set your temperature, the system will automatically adjust output according to the condition requirements. It uses R410A refrigerant, the industry standard. It also includes anti-corrosion treatment of the outdoor Heat Exchanger Fin. Daikin offers great variety and configurability in your selection of the two or three indoor units required for this system. All indoor units offer a variety of fan speed options and auto restart operation. You can use the drop-down boxes above to customize your system. If you need further guidance with your decision or if you have any configuration questions, our sales staff would be happy to help you. Contact us for expert advice. Indoor Wall Units (CTXS07LVJU, FTXS09LVJU, FTXS12LVJU, FTXS15LVJU, FTXS18LVJU) - Each indoor wall unit comes in a white finish and will fit flawlessly into any room decor. It can be installed on an interior or exterior wall and is connected to the outdoor compressor through a small opening in your wall, drilled behind the unit. The line set and wire (required, sold separately) are sent through the opening and connect to the compressor outside. A wireless remote is included for convenient operation from anywhere in the room. Available in 7,000, 9,000, 12,000, 15,000, and 18,000 BTUs. Slim Duct Units (FDXS09LVJU, FDXS12LVJU, CDXS15LVJU, CDXS18LVJU) - Slim Duct Ceiling units are installed in a ceiling and hidden from view. The Daikin Slim Units are less than 8" high and require ducting as well as registers. The placement of the registers allows the conditioned air to be dispersed into the space where you need it. Depending on the size and shape of your space, a concealed unit can be ducted for multiple rooms or one single room. As an example, a 12,000 BTU unit will provide comfort control up to about 400 - 550 sq. ft. A wireless remote is included with each unit. 9,000, 12,000, 15,000, and 18,000 BTU units are available. The 3MXL24RMVJU can be used with 3 indoor units. 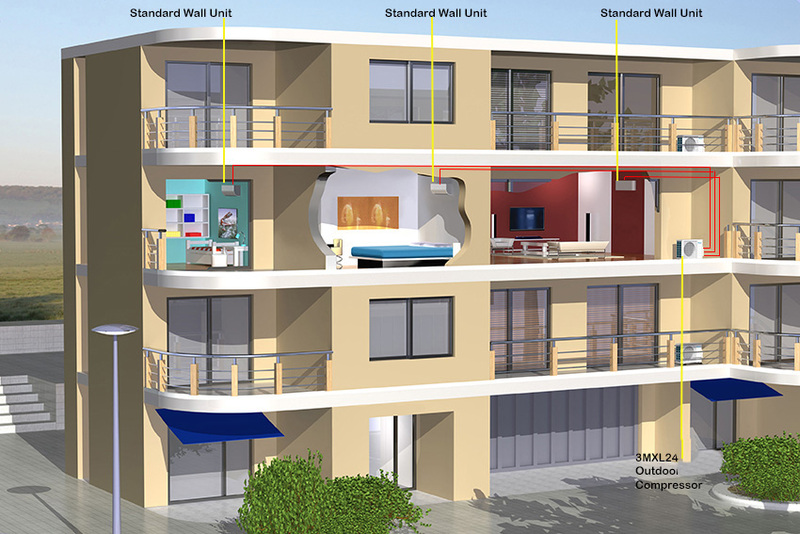 Above, is an example of a three zone layout in a multi-family dwelling. This item replaces the 3MXL24QMVJU unit.